July is the month for patriotism and parades and dragging out the history. Here are a couple of new selections from Covenant Communications. The fact that proxy temple ordinances were performed for the signers of the Declaration of Independence and several U.S. presidents in August 1877 is neither new nor secret, yet it’s not something we normally cover in Sunday school class. The story of how that came about when Wilford Woodruff was president of the Church is succinctly stated as temple work carried out according to instructions of the signers themselves who appeared in Woodruff’s recurring dreams. Visions of Freedom presents the story at a much slower and unfocused pace, interweaving with it the history of the St. George Temple and principles of latter-day temple work. Biographies of each of the signers comprise the bulk of the book, some quite brief and others occupying several pages, according to the notoriety and hence the available information about the individuals. Most interesting to readers may be Appendix 9, which lists names of the men and women for whom temple work was done on those two days in August 1877. Other appendices present extracts from journals of Woodruff and John D.T. McAllister referencing the events. 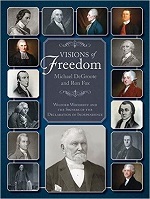 Visions of Freedom is 274 pages in soft cover, $19.99. 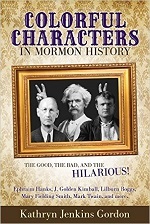 Much more readable is Covenant managing editor Kathryn Jenkins Gordon’s Colorful Characters in Mormon History: the Good, the Bad, and the Hilarious! (2015, 265 pages in soft cover, $15.99). The writing is as much a reflection of the author’s light-hearted personality as it is the documented facts about people who were not necessarily Mormons but figured prominently in its story. For instance, we read of the comedic mileage Mark Twain gained from a two-day visit to Salt Lake City and his own rewriting of “tales” from the Book of Mormon, and of Samuel P. Cowley, half-brother of Matthew, whose work with the FBI made him a favorite of its chief, J. Edgar Hoover. Gordon fleshes out the story of Charles Anthon, the noted professor whose dissing of the gold plates and the characters on them has landed him in the “Mormon Bad Guy Hall of Fame forever.” Well-told (and footnoted) stories of Parley P. Pratt, Martin van Buren, Jim Bridger, Ephraim Hanks, and a bunch of other men are included. Mary Fielding Smith is the sole female represented among the 20 “characters,” with the real story of her ox being healed. Her gutsiness is legend for a reason. Gordon has a gift for taking dry facts and molding them into an entertaining read. May there be a second volume of Colorful Characters — with the stories of a few more women on its pages.